Fungi that feed on vegetation can keep any one species from dominating. 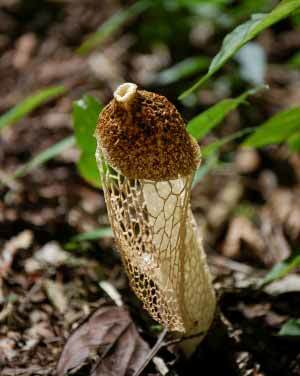 Fungi such as the netted stinkhorn (genus Dictyophora) get more efficient at killing a plant that becomes more prevalent, and so they help to keep populations in check. Voracious pests may be foes of individual plants, but they can benefit forests. A study in the humid rainforests of Belize shows that plant-killing fungi can help preserve diversity in such ecosystems. The study, published today by Nature1, provides experimental support for a leading ecological hypothesis on why any given plant species does not take over in species-rich forests. That proposal — the ‘Janzen–Connell hypothesis’ — posits that as the population of a plant species grows, so does the rate at which specialized pests dine on it. Those pests then keep dominant plants in check, giving other species room to flourish. Since the Janzen–Connell hypothesis was proposed more than 40 years ago, many research teams have gathered evidence that plant-munching insects and other predators keep populations of plant species in check. But few were able to establish that this mechanism also boosted plant diversity, says Clay. Owen Lewis, an ecologist at the University of Oxford, UK, and his colleagues decided to test the hypothesis experimentally. The team marked field plots in the Chiquibul Forest Reserve in southwestern Belize, where the ground is laced with thick, shallow roots and seeds fall from a thick canopy overhead. Some of the plots were treated with fungicides, and others with an insecticide. Control plots were sprayed with water. 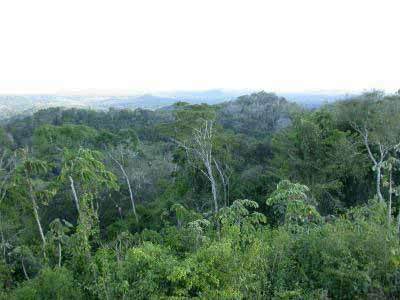 A view of the Belize rainforest. Over the course of 17 months, the team found that species richness was reduced by about 16% in plots sprayed with fungicide. Although there was no decline in species diversity in plots sprayed with insecticide, this treatment altered the relative abundance of species present. Lewis and his team plan to expand their work to other locales, and have begun identifying key fungi in the Belize test plots. Lewis notes that the work could be important for understanding how forests might react to climate change because fungi are very sensitive to changes in humidity. A new study has revealed that fungi, often seen as pests, play a crucial role policing biodiversity in rainforests. The Oxford University-led research found that fungi regulate diversity in rainforests by making dominant species victims of their own success. Fungi spread quickly between closely-packed plants of the same species, preventing them from dominating and enabling a wider range of species to flourish. 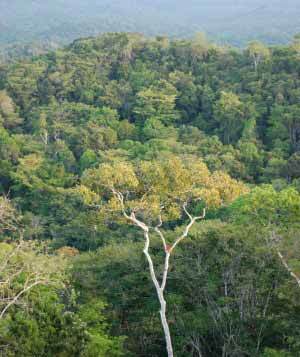 This is a shot of the rainforest canopy in Belize, where researchers found that fungi helped to police biodiversity in plants. 'In the plant world, close relatives make bad neighbours,' said Dr Owen Lewis of Oxford University's Department of Zoology, who led the study. 'Seedlings growing near plants of the same species are more likely to die and we now know why. It has long been suspected that something in the soil is responsible, and we've now shown that fungi play a crucial role. It's astonishing to see microscopic fungi having such a profound effect on entire rainforests. The study, published in Nature, looked at seedling plots across 36 sampling stations in the Chiquibul Forest Reserve, Belize. It was carried out by scientists at Oxford University and Sheffield University and funded by the Natural Environment Research Council (NERC). Researchers sprayed plots with water, insecticide or fungicide every week for 17 months. They found that the fungicide Amistar® dealt a significant blow to diversity, reducing the effective number of species by 16%. While the insecticide did change the composition of surviving species, it did not have an overall impact on diversity. Scientists had suspected that fungus-like microorganisms called oomycetes might also play a part in policing rainforest diversity, but this now seems unlikely. 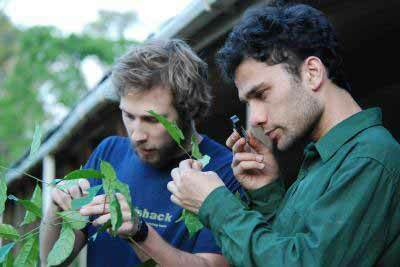 Robert Bagchi (right) and Tom Swinfield (left) identify plant samples in Belize to monitor plant diversity. The findings show that fungi play a vital role in maintaining the biodiversity of rainforests, preventing a few highly competitive species from dominating. It helps to explain why tropical rainforests are so much more diverse than forests in temperate countries.